Even for an artist hailed by Ebony Magazine as one of "7 Young Players to Watch" who has studied with jazz heavyweights like Charlie Haden, Wadada Leo Smith, Dave Douglas, Joshua Redman, and Matthew Shipp, it takes considerable confidence and courage for a young musician to match wits with veteran improvisers like William Parker and Gerald Cleaver. 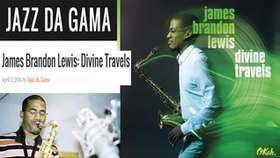 But on his second release, Divine Travels, saxophonist James Brandon Lewis does just that, not only holding his own with that masterful rhythm section but leading them down fresh and unexpected pathways. 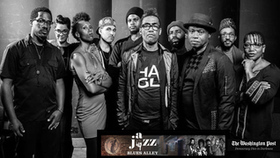 Divine Travels melds the holy spirit of a gospel service with the fiery expression of free jazz, the intuitive dialogue of skilled improvisers with the stunning invention of a first meeting. Lewis' music draws in equal parts on his considerable studies and his roots in the church, as well as his considerable curiosity to discover more and deeper connections within his music. 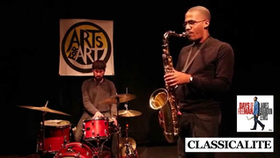 Parker and Cleaver have a long history together, having co-founded the collective trio Farmers By Nature with pianist Craig Taborn and played together with artists like Ivo Perelman, Matthew Shipp, and Joe Morris. And both have worked with some of modern jazz's greatest saxophonists: Parker with David S. Ware, Peter Brötzmann, and John Zorn, Cleaver with Roscoe Mitchell and Tim Berne. Lewis calls the prospect of stepping into such esteemed shoes "a humbling experience." It was demanding for me to keep my composure and to really be honest with myself in that scenario. How do I go into this session and not think about everyone that these two gentlemen have worked with in the past? I truly respect them to the nth degree, but I had to be honest and give who I am as a person, to be vulnerable to however the recording was going to come out. And I think that I left an impression, just like they left a huge impression on my being." Lewis' unique stamp can be heard throughout Divine Travels, which results in Parker and Cleaver revealing new facets in their own strongly individual voices. Fragments of gospel melodies emerge and evoke starkly spiritual meditations in tunes like "Wading Child in the Motherless Water," which weaves together the familiar melodies of "Wade in the Water" and "Sometimes I Feel Like a Motherless Child." But even when not explicitly referencing such traditional fare, Lewis shows a predilection for direct, memorable folk-like melodies that he can then develop, evolve and explore. 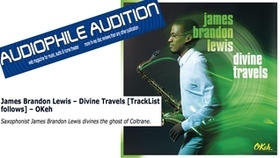 The title Divine Travels pays homage to Lewis' belief that the music contained within is an expression of his own spiritual journey, marking both distance traveled and experiences yet to unfold. Lewis' own travels began in Buffalo, New York in 1983. Lewis was raised in the church, which formed the core of the saxophonist's spiritual outlook. While many musicians are inspired by the church, Lewis says that its most important impact was not musical but personal, laying the foundation for his creative approach. 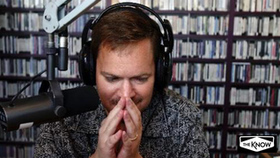 In 2006, Lewis moved to Colorado and pursued a career in gospel music, working with Grammy® Award-winning singer Dorinda Clark Cole and the late "Queen of Gospel Music," Albertina Walker. He relocated again to earn his Masters at CalArts, where he was mentored by Charlie Haden, Wadada Leo Smith, Vinny Golia, and Weather Report bassist Alphonso Johnson, who later hired Lewis to play in his ensemble. Lewis released his debut album, Moments, in 2010, before moving to New York City in 2012. 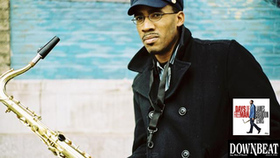 Since arriving in the city, he has performed with a wide range of artists, including Charles Gayle, Ed Shuller, Kirk Knuffke, Jason Hwang , Marilyn Crispell, Ken Filiano, Cooper Moore, Darius Jones, Eri Yamamoto, Federico Ughi, Kenny Wessel, Marvin "Bugalu" Smith, and Sabir Mateen, and has worked with the dance company CircuitDebris under the direction of Mersiha Mesihovic. He currently leads his own trio with Luke Stewart on bass and Dominic Fragman on drums. 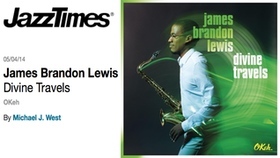 Visionary composer and tenor saxophonist James Brandon Lewis's bravest, yet most palpable artistic feat, opens with a poignant and profound introductory monologue from a maternal sage. She says: "The best thing of living is living who you are. You can't be somebody else; you gotta be what God gave you to be and who you are. You look in the mirror and see yourself and say ‘I'm James Brandon Lewis."' Next, bass and drums congeal around the sapphire melodic motif of "Brother 1976," recalling one of those jazzy jewel-like hooks from a 1990s Native Tongue hip-hop jam. The effect is like 1990s hip-hop's fascination with jazz being spit back by a prodigious jazz innovator. 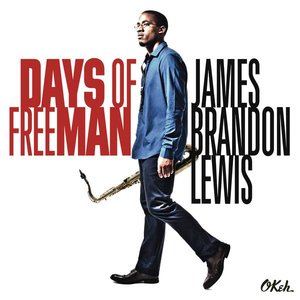 Welcome to Days Of FreeMan (OKeh). Some of the most trusted names in jazz and a host of innovative young disrupters brought cross-media collaborations and fresh approaches to the genre. The New York Times 'Best Jazz of 2018 includes; 8. 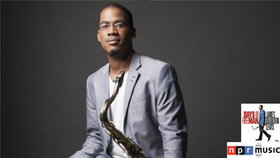 James Brandon Lewis/Chad Taylor, ‘Radiant Imprints' On this duo album, James Brandon Lewis honors John Coltrane by isolating parts of his compositions, diving into the source material with strident, ennobled conviction. Whether charging on the drum set or playing the hypnotic mbira, Chad Taylor knows where to find Mr. Lewis at his best. GETTY IMAGES 20. Cécile McLorin Salvant, ‘The Window' The reigning jazz vocalist of her generation is an intellectual virtuoso, an examiner of songs rather than simply an inhabitant of them. 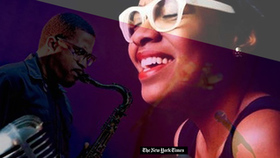 Accompanied by the pianist Sullivan Fortner, Cecile McLorin Salvant trains her magnifying glass on a range of tunes here: midcentury jazz, chanson, Aretha Franklin. "I didn't grow up a hip-hop head," says James Brandon Lewis, "but where I grew up in Buffalo, New York, on Freeman Street, the sound of hip-hop was ubiquitous. I decided to go back and explore that time through music." Don't look now but the most spectacular marriage of jazz and hip-hop yet just came from an utterly extraordinary young tenor saxophonist from Buffalo who, quite frankly, makes Robert Glasper seem anemic and academic. He's been living and working in New York for years but "Days of Freeman" is an extraordinary musical autobiography of growing up in Buffalo where Lewis remembers "times being filled with nicknames, block parties, street football and my older brother being the ‘deejay' of the household while my mom would be yelling ‘turn that crap down.' "
Here is a musical memoir in four chapters, whose first chapter is called "Buffalo Braves." It's a formidable musical memoir in which we hear, all through it, tiny snippets of Lewis' grandmother philosophizing and reminiscing about hearing Mahalia Jackson in her church and being free in her life because she was taught how to love by her parents. There are references to Wilson, N.Y., where "my family would fish and have fun times there." 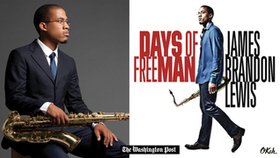 We're told in the publicity for "Days of Freeman" that the saxophonist poured over "hip-hop documentaries for up to eight hours a day" and dissected "albums by KRS-One, Digable Planets, Pete Rock and CL Smmoth, a Tribe Called Quest, Medeski, Martin and Wood, along with fearless jazz trumpeter Don Cherry's 1985 album ‘Home Boy' and Lauren Hill's 1998 Masterpiece ‘Miseducation of Lauryn Hill.' "
This is an utterly extraordinary disc – magnificently ambitious and completely achieved because of Lewis' most important musical partners – drummer Rudy Royston and, most important of all, the late Ornette Coleman's phenomenal bassist in his prime time band Jamaaladeen Tacuma. A one-time gospel saxophonist turns free jazz, weaving together two spirituals while caught up in the Holy Ghost trance. 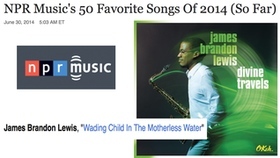 James Brandon Lewis' performance of Wading Child in the Motherless Water from his album, Divine Travels, is featured on NPR Music's list of 50 Favorite Songs of 2014 (So Far). Can a focused mind wander? Can a peaceful person do battle? 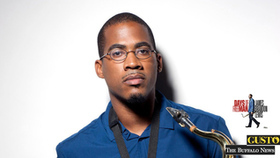 Contrasts and unlikely associations seem to guide the young saxophonist James Brandon Lewis, perhaps none more than this one: How does complication and murkiness help you access something simple-even elemental? Lewis, 30, was raised playing jazz and gospel in Buffalo, N.Y., then educated at Howard University and the California Institute of the Arts. With a sound that reaches out, touches firmly, then pulls away, he seems accustomed to following his convictions on a beeline, even when they lead into the thicket. What I'm angling at here is that things sometimes get choppy on Divine Travels, Lewis' new album and his first on a major label, but they never throw you overboard. The record casts an imposing shadow-it features William Parker on bass and Gerald Cleaver on drums, two of the most storied free improvisers around, and finds Lewis in wrangling, stippled interplay with the poet Thomas Sayers Ellis on two tracks. But it doesn't let go of you, partly because Cleaver plays the drums like Abdullah Ibrahim plays piano, laying out a bed of tone and topography rather than overemphasizing his punctuation marks. And partly because Lewis is big on consolidating impulses: He makes sense of all his reference points (classic gospel, mid-period John Coltrane, Dewey Redman) by draping his improvisations around minor-key structures. They give your ear context, and a home base. Lewis performs at Blues Alley this Thursday with a different trio: Dominic Fragman on drums and Luke Stewart (also an editor for CapitalBop) on drums. Lewis and I spoke via phone earlier this month about his time as an undergraduate here in D.C., his collaboration with Ellis (a D.C. native and former go-go singer), and the dedication to openness that informs his approach. READ THE FULL Capitalbop INTERVIEW. Quite tonal (and tuneful), Divine Travels is nonetheless free jazz. 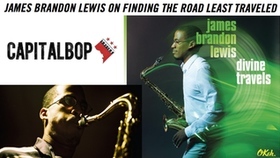 It's the major-label debut of tenor saxophonist James Brandon Lewis, quite a departure from the R&B earthiness of 2011's self-released Moments. Two masters of the avant-garde, bassist William Parker and drummer Gerald Cleaver, join Lewis here for 10 experiments with improvisation in melody, groove and texture. The results are excellent. Like Ornette Coleman, Lewis is a proponent of rich themes, whether in composition or improvisation. "Desensitized" comprises two alternating sax themes, a few notes repeated ad infinitum (with a minimum of variation) while Parker and Cleaver follow and embellish with inspired synergy. Meanwhile, on the closing "Travels," Lewis begins with a "do-re-mi" vamp that soon develops into more elaborate phrases and recitatives (until ending with a reprise of "Divine," the theme that begins the disc). The long centerpiece, "Wading Child in the Motherless Water," interweaves the melodies of the spirituals "Motherless Child" and "Wade in the Water." It's a cerebral undertaking, but not to the sacrifice of those songs' beauty or depth of feeling; to the contrary, Lewis reinforces it with the grittiness of his tenor sound. But his thematics don't always lead the way. 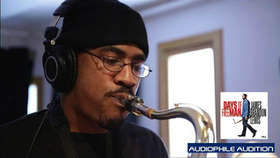 He spins short figures on "Tradition" as comments for Cleaver's crisp, melodic drum solo, and ones on "Enclosed" that are setups for Parker to respond and counterpoint. His full-on improvisation on "No Wooden Nickels" is really just window dressing for Parker and Cleaver's cha-cha groove-which goes on and on, in the best way possible. The album has one irritating quirk: Almost every track ends in a fade. The effect is of a string of non-resolutions. Even so, Divine Travels is the work of a promising new voice. 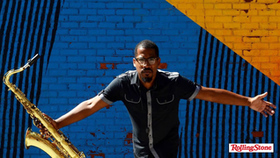 Saxophonist James Brandon Lewis takes us on a spiritual journey on his sophomore release, the aptly named Divine Travels. Over the course of Lewis' ten original compositions, which add up to 67 minutes, the NYC-based Lewis traverses a path which combines elements of free or avant-garde jazz, post-bop and the kind of auditory terrain which John Coltrane navigated toward the end of his career. On Divine Travels, Lewis weds his gospel and jazz background into a cohesive manner: he tried to do the same on his debut, 2010's Moments, but here the music and his intent coalesces and gels. READ THE FULL Audiophile Audition REVIEW. 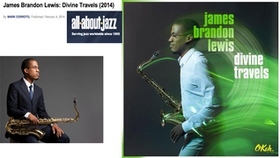 An auspicious major label debut for saxophonist James Brandon Lewis on - Divine Travels for an unpretentious bluesy jazz recording. Lewis, a thirty-something tenor saxophone phenom chose to record here in trio without the safety net of a pianist or accompanying horn. READ THE FULL All About Jazz REVIEW.